Welcome to part three of Family History and Fiction Writing. This week I want to discuss the almost boundless possibilities afforded by the use of printed and written sources, such as newspapers, birth, marriage and death certificates, and journals, diaries and letters. For the purposes of your story, these don’t necessarily have to be ‘old’. You could use modern newspapers just as well, if you can’t get hold of any old ones, or if your story is set in the here and now. 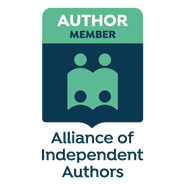 We writers can find endless plot ideas in the pages of the tabloid or local newspaper, and you don’t have to stick with just one, you can marry a couple of different stories together. And don’t forget, if you are writing fiction, you can change the details around as much as you like. Look out for odd or quirky items that will fire your imagination, and not just the usual tales of someone doing something terrible to someone else. Here in Derby, our local newspaper includes a ‘Bygone Derby’ section regularly, giving us (some would say ‘repeats’) snapshots from the city’s past, with old photos and old news stories. Maybe your local paper does the same? Libraries, Local Studies libraries and Family History centres often hold old newspapers, albeit mainly on fiche or film. Or you could purchase a short subscription to the British Newspaper Archive, or if you are a member of a family history site, they also sometimes have newspapers available. I recently (about five years ago!) bought something on eBay from South Africa (can’t remember what) and it arrived in a big box stuffed with – you’ve guessed it, newspaper! I smoothed it all out and added it to my stash, along with local newspapers snagged from holiday destinations. I have found a huge amount of interesting stuff for not only my own family tree research, but also for short – and long – stories. I wrote a short ghost story based on stuff I’d read about an old hospital that was being demolished at Shardlow – the work had to be halted whilst a medium was called in – yes, truly! You can also buy facsimile copies of front pages for your date of birth, and many museums sell little World War two (and one) packs of replica documents such as ration books and government information, along with replica newspapers. Once you start to look, there is tons of stuff ‘out there’. At the top of the page, this is a copy of a real news article about my umpteen-greats grandfather, Henry Eve, a Master Lime Burner. I also have a copy of his death certificate, which showed he died following a fall into a chalk pit. I was surprised that a) he was still working at 88 (actually he was 86 but they never get it right, do they?) and b) his cottage, that he and his wife shared, was actually IN the chalk pit!!! And below, an interesting little story I found whilst reading about more misdeeds by my Mercer clan! 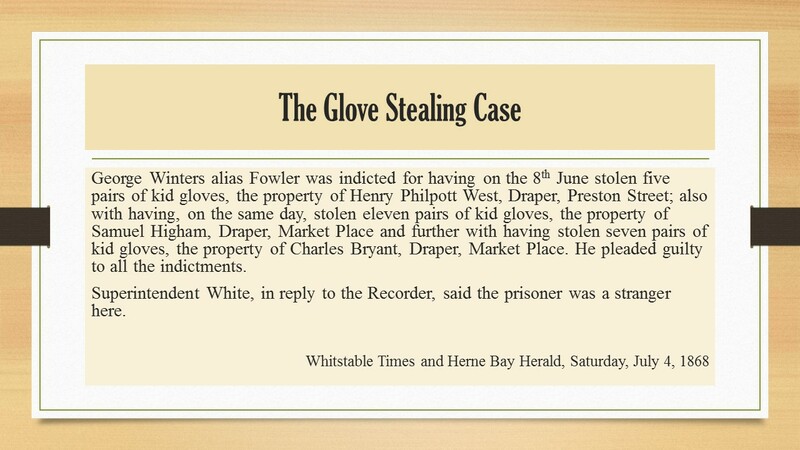 The glove-nicker (no relation to me, for once) claimed he was only doing it to support his poor old mother, and he was sentenced to nine months hard labour – three months for each offence. I expect we all know about birth, marriage and death certificates. They have been the staple of family history research for many years, since registration began in September 1837, one of the new laws of Queen Victoria’s rein. But these certificates do provide (generally speaking) so much information, and so much inspiration for the writer. Take a marriage certificate, for example. Here you have two people, taking a big step together, at a crossroad in their lives. The marriage cert is a window on the past, a snapshot in time like no other. (Sorry about the cliches, but it is true in this case!) We have the where, the when, we have their names, often their ages (sometimes, disappointingly it just says ‘of full age’), the occupation of the groom, occasionally an occupation for the bride, their address at the time of the marriage, we have who performed the marriage, we often have witnesses, and the names of fathers and their occupations. Wow! A whole back story in one easy document. And we are also told whether they married by banns or by license. Birth certificates and Death certificates also give us a lot of information, but very often this information is lacking – which is so frustrating. Sometimes, if the baby was illegitimate, we are told nothing about the father. (Hint, if it says base born on the certificate, there might be father’s details in parish registers; the father’s name could be given by the child’s mother for a christening but not for registration, where the father, if not also the husband, had to be present to be included on the certificate.) Often the causes of death on certificates give us a real insight into the situation of a family, whether they live in poor conditions, or work in a hazardous industry. For example, one of my ancestors died from Plumbism – a type of lead poisoning frequently incurring in plumbers who handled lead in the pipes and solder. My Thomas Page was a plumber/painter/glazier, a common mix of talents in the Victorian era, and died in his early forties. In a roundabout way, Thomas brings me to my next point. It seems almost too obvious to say that these can give you lots of information and inspiration for stories. Not all of us have these documents to hand, though, so it’s always worth trawling through second-hand book shops, house clearance sales, libraries, family history centres and the rest of it, in search of someone else’s memories. Or you can buy published letters, memoirs and biographies, obviously. In our family we are fortunate enough to have a copy of Thomas Page’s journal – the father of the unfortunate chap above, this one began making notes about his work – recipes (receipts) for making solder, advice on how to plate a looking glass and billing information gave way to comments about the world around him. Thomas senior lived in Canterbury from 1826 to about 1910, and had a large family, some of whom caused him and his wife Charlotte no end of trouble. Here is a really blurry scan of a photocopy of a picture of him taken probably in the late 1890s or early 1900s, with not Charlotte, but his nurse (note his two walking sticks), Mary Boys, who did very nicely out of his will, which has caused a great deal of speculation. And below that, a couple of very short extracts from his journal. Now, you must forgive my ignorance. Until I read this, I had never heard of a ‘Day of Humiliation’. At first I and a few of my family history buddies thought it referred to poor old Thomas having a bad day at the office, but no. In fact it referred to a royally-decreed day of national fasting and prayer for success in the Baltic conflict. In theory at least, the whole nation was to avoid rich food and alcohol and to spend time in meditation and prayer to petition God for success in the campaign. There were I think, two, or possibly three of these days declared. How closely the average Joe-in-the-street adhered to or supported this, I don’t know, but the fact of it appearing in Thomas’ journal makes me think that at least some ordinary working chaps did in fact observe the day. Wow! There’s got to be a story in that. Basically due to something or other (a long story for another time perhaps) the woman and her family are under threat from a band of very angry people, her hubby’s safely away and she’s left to hold the fort. (Spoiler alert) Later we read how a militia came and escorted her to safety through an armed mob. Without these letters, we might know very little other than the ‘official’ military and political views of that turbulent era. If you enjoy writing historical fiction, these kinds of letters provide a depth of material, language and real experiences that you could draw on to provide colour and conviction to your setting, as well as key elements for your plot and development of your characters. So basically, what I’m saying is, there are stories out there, some merely in essence, some in full – the documentation of human life and experience – and we can grab any bit of it that suits us, work on it and hone it and develop our own truths and mysteries. We can use it to tell a story. Next week: the concluding part of this short series, putting it all together, and minding your legal Ps & Qs. This is great stuff Caron. There is so much information out there, except when it’s one of your own ancestors you’re looking for.